She's still pretty darn young, but she has a whole lot of potential... if you're pretty sure that your little one is going to grow up to become the next Wonder Woman, then there's no time like the present to start getting her ready. Besides, most prodigies start young, right? 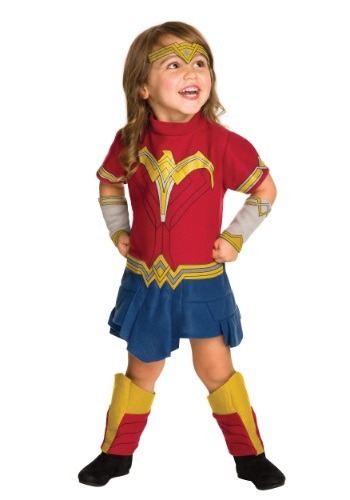 She might be a tad on the small side to battle the planet's worst villains, but that's no reason she can't look the part... with—you guessed it—this toddler Wonder Woman costume! This delightful fleece costume will have your little one ready for playtime or for costume dress-up fun. But when naptime rolls around, we won't blame her if she dozes off in this comfy setup. (The saving the day part can always come later)! Your toddler can dress up as Wonder Woman in this comfy fleece dress and we're sure she'll have no trouble showing off her super side. You might even learn a thing or two about her (hopefully no surprises lead to damaged property... )! The cozy dress is all polyester and secures with a Velcro tab in the back. Printed details and stiched costume patterns helps this get-up look pretty darn authentic. Just complete the look with the included fleece gauntlets, shin guards, and tiara, and she'll be ready for anything. Like the worst villains in the world—or maybe just the best nap ever!